We are standing just off the Euston Road in London and it is 1958. There are times when you wish the photographer had turned slightly before taking the photograph and this is one of them. Just to the photographers left is the famous Euston Arch, built in 1837 and demolished in 1963 just five years after this image was taken. What we can see here is one of the entrance lodges, which still remain today. 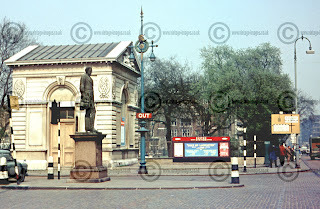 The statue is of Robert Stephenson and has today been relocated in the forecourt of the new station which was opened in 1968. The advertising hoarding opposite has the London Midland Region maroon enamel heading prominent and is advertising the Twin Screw Steamer Duke of Lancaster, then only two years old and running on the Heysham to Belfast route. British Railways ran ships as an extension of their rail services, along with hotels and at this time was a common carrier, by law having to transport all that was offered to them. The TSS Duke of Lancaster was in service until 1978 when she was bought for use as a static leisure centre and market. This was not a success and today she languishes out of use and derelict off the North Wales coast. The road signs visible are pre-Worboys signs which were replaced starting in 1963 but even today there are still one or two of these still around almost fifty years later. The traffic lights are painted with black and white bands which was changed in the 1960s to the standard grey colour with black surround to the lights that they are today. The bollards are also black and white and cast out of rather solid iron, although they would today perhaps be plastic and yellow! With that we should proceed into Euston Station and with the next post we shall travel twenty years further into the past and back to 1938. The front of the Palace......for real, this time! Ose! I thought you said "'oes!" The first post........Back to the Fifties!